Faraday’s and Ampere’s laws are converted to matrix operator form and rearranged such that the unknown relative permittivity and relative permeability tensors can be determined. 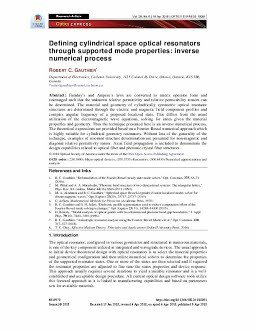 The material and geometry of cylindrically symmetric optical resonator structures are determined through the electric and magnetic field component profiles and complex angular frequency of a proposed localized state. This differs from the usual utilization of the electromagnetic wave equations, solving for states given the material properties and geometry. Thus the technique presented here is an inverse numerical process. The theoretical expressions are provided based on a Fourier-Bessel numerical approach which is highly suitable for cylindrical geometry resonators. Without loss of the generality of the technique, examples of resonant structure determination are presented for non-magnetic and diagonal relative permittivity tensor. Axial field propagation is included to demonstrate the design capabilities related to optical fiber and photonic crystal fiber structures.